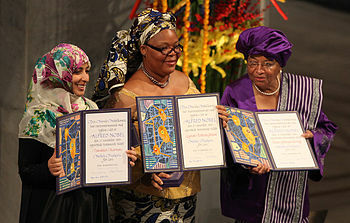 From left to right: Tawakel Karman, Leymah Gbowee, and Ellen Johnson Sirleaf displaying their awards during the presentation of the Nobel Peace Prize, 10 December 2011. The joint laureated were: Liberian President Ellen Johnson Sirleaf, Liberian activist Leymah Gbowee and Yemeni politician Tawakkul Karman "for their non-violent struggle for the safety of women and for women’s rights to full participation in peace-building work". In announcing the award on 7 October 2011, the chairman of the Norwegian Nobel Committee, Thorbjørn Jagland, stressed the link between women's rights, peace and democracy. The winner is selected by the Norwegian Nobel Committee from nominations by others. There were 241 nominations for the 2011 award, which included the European Union, WikiLeaks and individuals connected with the Arab Spring such as Israa Abdel Fattah and Wael Ghonim. The five members of the Nobel Committee are appointed by the Norwegian Parliament to roughly reflect the party makeup of that body. The Committee members may not be current parliament members or government officials. ^ "Nobel Peace Prize 2011". Nobel Foundation. Archived from the original on 5 October 2011. Retrieved 9 October 2011. ^ Paust, Thomas (7 October 2011). "Er dette den «ukjente» prisvinneren? [Is this the «unknown» prize recipient?]" (in Norwegian). Nettavisen. Retrieved 9 October 2011. ^ a b Lundestad, Geir 2012: "The Nobel Peace Prize: 1901-2000", Nobelprize.org. ^ "Winston Tubman: Nobel laureate Sirleaf is 'a warmonger'". (7 October 2011). BBC News. Retrieved 10 October 2013.